they will change their ways. Leaders of the Palestinian prisoners’ movement in Israeli prisons and detention facilities stated that the situation all political detainees are facing is at its worst, adding that, right now, detainees sentenced to life-terms are thinking about launching an Irish-Style Hunger-Strike, while the rest of the detainees likely to follow their lead. In a statement that reach the Palestinian Ministry of Detainees, the detainees stated that their conditions are declining from bad to worse, and that their issue, and their release, must be a top priority to the Palestinian Authority. They said that Israel must be held responsible for its ongoing violations, ongoing attacks and illegal conditions it imposed on the detainees, especially since International Law and all related human rights resolutions guaranteed the rights of all political prisoners. They added that they support the stance of the Palestinian Liberation Organization (PLO) in refusing to resume peace talks with Israel until it stops its violations and settlement activities, and that the Palestinian leadership must always act on ensuring the release of all Palestinian detainees without any preconditions. 1. Israel must treat us as prisoners of war, in accordance with the Fourth Geneva Conventions. 2. We support the position of the PLO in refusing to resume peace talks with Israel until it stops its violations and settlement activities, and we affirm the right of all detainees to be released, especially those who spent many years behind bars. 3. 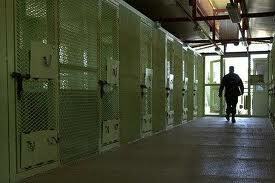 We refuse any attempt to delay talks on the detainees’ issue until the final stage of peace talks. 4. Our case is a top priority, and no final peace agreement should be reached without our release. 5. We demand a fair resolution to our cause, especially the old detainees, those who spent years behind bars, and we demand that the leadership should not resume peace talks unless our issue is resolved. Daily life in large parts of Pyuthan, Banke, Bardiya, Dang, Dailekh and Surkhet districts have been adversely affected since early Friday morning due to a daylong strike called by former Maoist combatants in mid-western region. The strike was enforced by ex-combatants who were discharged last year from the cantonments after being disqualified in the verification conducted by the United Nations political mission in Nepal. Reports coming in say that most of the shops, businesses and factories in the affected districts remain closed. Similarly, very few short-route vehicles are seen plying on the road while long-route vehicles have been brought to a grinding halt in the affected districts due to fear of attacks by the bandh enforcers. However, protest organisers demonstrating in major thoroughfares in Nepalgunj, Dang and Surkhet have not been seen disrupting the vehicles. The disqualified Maoist ex-combatants enforced the shutdown in mid-western region, demanding that the tag of ‘disqualified’ to describe them be removed and financial package comparable to those who have chosen voluntary retirement in the recent regrouping of the combatants. The combatants in exclusion had enforced a daylong strike in nine districts of far-western Nepal on Thursday to protest against the UCPN (Maoist) and the government categorizing them as ‘disqualified’ and ‘depriving’ them of any benefit or rights. Frank Bardacke labored over this book for fifteen years. We can be grateful that he didn’t give up. This is the best history ever written of the United Farm Workers (UFW) and Cesar Chavez. 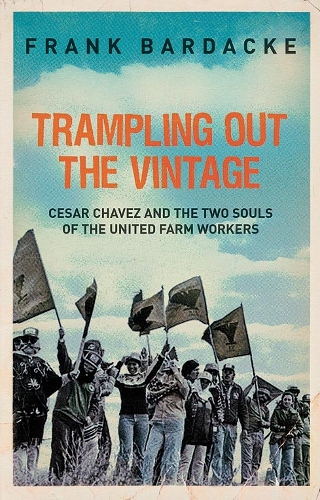 Trampling out the Vintage explains better than any other book how the UFW under Chavez’s leadership became in the 1960s and 1970s one of the most remarkable and successful unions in U.S. history but then crashed and burned so breathtakingly fast that by the end of the 1980s it had pretty much disappeared from the fields. Bardacke relies on primary sources—letters, interviews, personal papers, archives, newspaper accounts, court and police records, his own considerable experiences as a farm laborer (He spent six seasons in the fields between 1971 and 1979. A minor political conflict with the union during the 1979 lettuce strike led to his blacklisting by both the growers and the union, and this forced him to take up other employment). In the main, he lets the record speak for itself, avoiding the apologetics or the rancor we typically find in books, articles, and reviews about the UFW and Chavez. Several things set Bardacke’s history apart from everything that preceded it. First, he pays attention to the farm workers themselves, to their organizing history, the nature of their work, and the changes that have taken place in their industry. His descriptions of the skilled, difficult, and body-destroying work of harvesting lettuce, celery, broccoli, asparagus, and lemons are among the most moving and beautifully written parts of the book. They help to foreground the author’s demonstration that the organization of farm workers did not spring suddenly from the will of Cesar Chavez. As Bardacke shows with scores of examples, agricultural workers have been doing battle with their employers for nearly one hundred years. Their skills, the short time the growers have to get crops harvested, and the self-organization of the workers, especially those who toiled as part of tightly-knit teams, all combined to create a sense of potential power, power that became reality when conditions were propitious. Second, Bardacke delves into Cesar Chavez’s life in more depth than anyone ever has, giving him insights that are critical to an explanation of the historical trajectory of the UFW. Unlike most of the union’s members, Chavez’s parents owned a small farm and suffered sharp downward social and economic mobility when they lost it in 1939 and had to work in the fields. The anger he felt because of this was not the same as that experienced by another UFW stalwart and founder, Gilbert Padilla, who was born into a farmworker family, worked in the fields as a young child, and learned class consciousness as he lived his life. Padilla had a natural affinity with the workers that Chavez never had, and he was not nearly as anticommunist as was Cesar. Chavez also identified more as a Mexican-American (a Chicano) than as a Mexican. The first workers in the UFW were settled vineyard laborers and not migrants. Chavez had a lifelong antipathy for the unsettled Mexicans who soon enough comprised the majority of California’s farmworkers. Cesar Chavez was also a devout and conservative Catholic. He embraced both the “social action” philosophy of Pope Leo XIII, which recognized certain rights of working people, and the strictly hierarchical structure of the Church. Under the tutelage of Saul Alinsky and Fred Ross, Chavez was able to blend his Catholicism with Alinsky’s community organizing techniques to become a master organizer, first in community action groups and then in his union. He came to believe with Alinsky and Ross that organizing could be taught and that the organizer was the critical actor in all efforts to build political power. At first, he also accepted the Alinsky position that the organizer had to be a disinterested outsider, who, once an organizational structure had been built, moved on to the next assignment. However, when his superior organizing skills helped build a core farm labor organization, he decided to remain as both the organizer and the leader. He thought that he could be both the disinterested organizing outsider and the insider running the union. As might be expected, this proved untenable. An outsider might be able to assess a situation objectively and offer useful advice and criticism to the insider. But when the two roles are combined in the same person, problems are bound to arise. Chavez, as an insider, could run the union, and Chavez, as an outsider, could criticize too. But when he began to identify the union with himself, who else inside the union could criticize him? Most writers and commentators who have attempted to explicate the UFW’s history have argued that there was a sharp change in Chavez’s behavior after the union’s failure to win a referendum that would have built funding for the 1975 California Agricultural Labor Relations Act into the state’s constitution. Bardacke’s analysis of Chavez’s life, however, shows that there was a consistency to what Chavez did throughout his tenure as UFW president. The State of Israel killed 180 Palestinians in 2011, including 21 children. These shocking figures were given in a report issued by the Palestinian Liberation Organisation entitled, “A People under Occupation”. The year also saw 3,300 Palestinians in the West Bank and Jerusalem detained by the Israeli occupation authorities. The PLO report noted that in 2011 alone the government of the Zionist state approved the construction of another 26,837 settlement units across the Occupied Palestinian Territories, including 1,664 housing units in and around Occupied Jerusalem; almost 4,000 acres of land belonging to Palestinians have been confiscated by Israel; 495 houses have been demolished; and 18,764 olive and fruit trees have been uprooted. With regards to Jerusalem, the report records that the establishment of the Shu’fat military checkpoint by the Israelis, which separates Jerusalem from the Shu’fat refugee camp, has resulted in the isolation of more than 60,000 Palestinians living in the camp and the areas around it. This is part of what the compilers of the report confirm is Israel’s Judaisation policy, as was the closure of the Magharba Gate Bridge which leads to Al Aqsa Mosque. Illegal Jewish settlers, claims the PLO report, have committed a series of “terrorist” attacks on mosques throughout 2011, which escalated in December with arson attacks on the Okasha Mosque in West Jerusalem, the Nour Mosque in the village of Burqa in Ramallah, and the Ali Ibn Abi Talib Mosque in the village of Bruqin village in Salfit. Settlers also, the report notes, wrote racist slogans on the Sahaba Mosque in Bani Naim in Hebron and violated the sanctity of the St. John the Baptist Orthodox Church near the River Jordan. Also in December, Jewish settlers set fire to at least 12 Palestinian vehicles across the occupied West Bank and confiscated around 500 acres of Palestinian land to expand their illegal settlements near Jenin and Bethlehem. The San Francisco Chronicle’s front-page headline “Governor to Oakland: ‘Keep the port open’ ” could have been gleaned from the newspaper’s 1934 edition when Gov. Frank Merriam vowed to bring order to the city and break the maritime strike by deploying the National Guard. It was the height of the Great Depression and workers were desperate for jobs or to share the existing jobs on the waterfront. But the union stood fast. After a general strike to protest the police killing of two strikers, the seamen and longshoremen won the union hiring hall that shared the available work equitably. Once again, the Bay Area is at the forefront of social protest. Twice police evicted Occupy Oakland using tear gas and “less lethal” munitions, and twice supporters of the Occupy movement responded. Thousands of Occupy protesters peacefully marched to the Port of Oakland, shutting it down in protest of the depredations of what they call the 1 percent. The protesters proclaimed their solidarity with the longshore union’s struggle in Longview, Wash., and with port truckers. The business community cheered the evictions, but now its members are up in arms, complaining about shutdowns at the port, the funnel for much of their profits. It’s obvious which side they’re on. The Oakland Port Commission tried to stop the Dec. 12 protest with full-page ads in the Oakland Tribune, the New York Times and The Chronicle, shedding crocodile tears about the port truckers and other port workers who would be unable to work. The commissioners pose as defenders of the “99 percent,” but in fact they stand in the way of the heavily exploited port truckers and port warehouse workers getting into a union with decent wages, benefits and conditions. 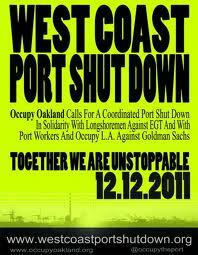 Port workers recognize a sham when they see one and thus honored the picket lines. Gov. Jerry Brown and Oakland City Councilman Ignacio De La Fuente also have joined the fray by chastising Mayor Jean Quan for not stopping the protests. Yet both were involved in similar port protests 14 years ago. Brown, just launching his mayoral campaign, participated in a solidarity picket line in 1997 that shut down the Oakland terminal for four days in support of 500 sacked Liverpool, England, dockworkers. 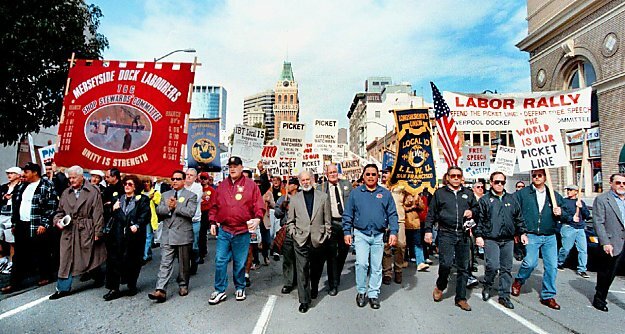 Union leaders, including ILWU Local 10 President Henry Graham (left), California Federation President Jack Henning, Alameda Labor Council President Judy Goff and Oakland City Councilman Ignacio De La Fuente (wearing a gray suit,), paraded down 13th Street in Oakland in 1998 to protest the lawsuit filed against union members who picketed a ship from Liverpool. And De La Fuente led the thousand-strong union protest through downtown Oakland in 1998 to demand the charges be dropped against the port protesters. Now they’re singing a different tune. This isn’t the first time Brown has called to use police power in the port. As Oakland mayor in April 2003, he called in the riot police to quash a peaceful antiwar demonstration at the port. Scores of demonstrators (and several longshoremen) were badly injured by some of the same munitions recently used on Occupy Oakland. The U.N. Human Rights Commission condemned the police action as the “most violent” repression of protests against the war. It cost the city more than $2 million. Brown promised to appoint a “blue ribbon” commission to investigate, but it never materialized. Now he admonishes Quan for not following his example. Businessmen, politicians and even union officials have expressed outrage about the “damage” done by port “disruptions.” Yet when maritime employers shut down all West Coast ports for two weeks in 2002 by locking out longshore workers in the midst of contract negotiations, you could hardly see any complaints in the media or from politicians about the employers’ “disruption” of the port. Sen. Dianne Feinstein, D-Calif., was lauded when she called on President George W. Bush to invoke the slave-labor Taft-Hartley Act, forcing longshoremen back to work under conditions favorable to the maritime companies. They knew which side they were on then, too.